Release Day Blog Blitz- When a Warrior Woos a Lass by Julie Johnstone! The past haunts them. Treachery awaits them. Love will save them. Scarred by the cruel whims of her late husband, Lena MacLeod lives in fear of men and marriage. So when the king’s edict obliges her to wed Scottish warrior Alex MacLean, she never expects to feel safe, let alone happy. 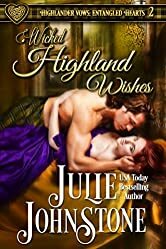 But behind Alex’s fierce exterior lies a gentle, gallant highlander who renews her soul, emboldens her, and offers her the one thing she never thought she would possess—true love. Now that Alex has her whole heart, she’ll settle for nothing less than all of his. Haunted by violent nightmares of his dark past, Alex MacLean has put off getting married for as long as possible. But now he finds himself the husband of the fragile, beautiful Lena, and he’s drawn to her as he has never been to another. He vows to protect and heal her, and as she grows stronger, so does his love for her. Yet, his horrible memories and a treacherous task are preventing him from giving himself to her entirely, and the secrets he harbors threaten to destroy their life together. When Lena uncovers a dangerous scheme involving Alex, she embarks on a desperate journey to save the man she loves. But Alex still hasn’t let her in, and he runs the risk of losing her—and his life—unless he can accept that his once delicate wife is now an ally strong enough to light his way. Lena swept her gaze around the room, seeing nothing but the same swarming crowd of merry wedding revelers. Then she spotted a flash of thick, wavy, brown hair tinged with golden and russet strands woven through it. She knew without glimpsing his face that the luxurious hair belonged to Alex MacLean. He turned and his features came into perfect view. Even with the disgruntled expression he was wearing, Alex made Lena’s stomach clench. It was not the first time, nor did she suspect it would be the last. As laird of one of the most powerful clans in Scotland since he was fifteen summers, he possessed a commanding presence. She studied him from under her lashes, trying to discern why he was scowling. A smile pulled at her lips as she realized his unrelentingly determined younger sister, Bridgette, who was married to Lena’s older brother Lachlan, had Alex’s hand clutched in hers and was leading him somewhere. Alex was not the sort of man to be led; he was the warrior who others followed. Still, he had a soft spot for his sister, as well as a ferocious protectiveness of her. They were but two of the reasons Lena knew he was a good man. Two years ago, when she’d seen him for the first time since she’d been taken from her home as a child, her reaction to him had shocked her to the core and then rapidly caused fear to course through her. She was drawn to him, and that was a very frightening thing since she could not tolerate a man even touching her, other than a brief hand to her elbow by her brothers to guide her or a swift hug from one of them. She had not expected to ever feel the pull of desire for a man again after enduring marriage to her late husband, but she’d heard enough chattering from her brothers’ wives to suspect that this tug low in her belly and heat that infused her chest was desire. The truth was that men frightened her, but something about Alex scared her less, which seemed ironic given every inch of his body seemed to be hardened by hours of grueling training and many more hours of actual combat. She drew in a sharp breath as he came closer, and his glistening bronze eyes locked on her. She felt a fleeting sense of hope when she was around him, as if she might not always be this bird with the irreparable wing, who would never know the joy of soaring into the wind. Part of her wanted to soar, but there was another part of her that had been beaten down by her now-dead husband’s cruelty and wanted to burrow under the dirt and hide. She bit her lip as she glanced at Marion. A blush stole from Marion’s chest to her cheeks, flushing them crimson, and she had a decidedly guilty look on her face. A suspicion niggled at Lena, and she gave a quick look back to Bridgette to confirm her theory. The russet-haired woman’s eyes sparkled with intent, and her chin was tilted up in determination. Intuition told Lena that her well-meaning sisters-in-law had conspired to push her out of her nest this night in an effort to make her fly. But she wasn’t ready; she might never be ready. “What have ye done?” Lena hissed under her breath. “Did it nae occur to ye or Bridgette that I stand in this corner because I dunnae like to dance?” Lena muttered. “Marion,” Lena said on a fearful gasp, “I kinnae dance with a man. Nae even Alex,” she rushed out in a tortured whisper. The color drained from Marion’s face as her lips parted in understanding, but it was too late. Alex and Bridgette were before them. As Bridgette released her hold on her brother, she took Lena by the arm and propelled her toward him with a chuckle. “Lena, Alex wishes to dance with ye,” Bridgette announced. A shiver of panic swept through Lena, and she stumbled into Alex’s unyielding body. When she looked up to apologize and put distance between him, the words caught in her throat, her hand frozen on his chest. His heart was racing beneath her palm, as if he was just as bothered by the prospect of a dance with her as she was with him. Behind her, feet shuffled and skirts swished as Marion and Bridgette moved away. Lena stood there gaping at Alex. As he stared back, it seemed as though a cloak had lifted from his eyes, and the tenderness in their depths sucked the air from her lungs. “I ken ye dunnae wish to dance,” he said in a voice as deep as an endless loch. For a moment, the masculine beauty of his face stole her ability to speak. Mahogany hair surrounded his sculpted features and curled below his ears and against his neck. Dark stubble covered his square jaw and above his full lips. His eyes, framed by thick, sinfully long lashes, narrowed slightly, and the veil she normally saw there fell firmly back in place, snapping her out of her daze. Heat scalded her cheeks. Of course, he knew of her past—almost everyone did—but no one ever spoke to her about it directly, save for the few times her sisters-in-law brought it up in an effort to help her. But neither of them had ever comprehended that a man’s touch sent a chill of black fright through Lena. So how could Alex know? 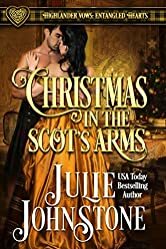 As a friend of her family’s, he’d known her all her life—or at least the early part of it when she had been living at Dunvegan before she had been seized by her uncle, who had done so to hurt her father. Yet, Alex did not know her as a woman, even though she had been home for a while now. They’d barely spent any time together, except once when he had aided her brothers in hiding her from her husband, who had convinced the king to return her to him. But during that flight, they had been accompanied by three of Alex’s men, so they had never been alone, never spoken of anything other than polite topics like the weather. She frowned as she darted her gaze among the merrymakers in the great hall. The men swung the women about in various stages of handholding or with their arms about the women’s waists. She swallowed hard, a sudden desire to allow him to hold her hand for a simple, safe dance flaring bright inside her. “We would look foolish if we danced without touching,” she replied in a low voice, fearful of someone hearing, though no one was close enough to do so. 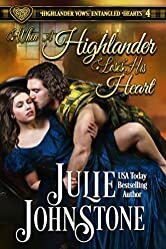 Author Julie Johnstone first fell in love with romance fifteen years ago when she picked up her first romance novel in an airport gift shop on the way to Conroe, Texas for a family reunion and spent her whole weekend reading rather than water skiing, which up until then was one of her favorite things to do. Julie stays up way too late typing furiously on her keyboard to finish her next book or blog with her fellow authors at Ladyscribes. She’s married to an amazing lawyer, and when she is not running her two precocious children to one activity or another, she tries to seek out some time to stay in shape and see her dearest friends. To enter simply tell me if you’re a fan of the author or if Julie Johnstone is new to you? 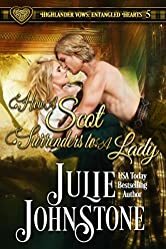 Do you enjoy reading Scottish/Highlander romances? If you enjoyed this post, be sure to sign up at the top right corner at Never Miss a Post! If it says You are following this blog, then you are good to go! *Please note that some cover images and text links connect to a Lorelei’s Lit Lair affiliate portal. Thank you so much for your support. It’s greatly appreciated! Previous Author Spotlight & Giveaway: Julie Anne Long! Next Looking Back at the Romance, Wine, & Chocolate ’17 Event! this is a new to me author. books sound fabulous. I have never read this author, but I do enjoy Scottish/Highlander romances. Sandra, I hope you love Iain and Marion! I. Have this book and all of hers in this series. I love all of her books so far. I’m a lover of Scottish historical romance and Regency romance. I’m a fan, and I love reading Scottish/Highlander romances. Thank you so very much, Janie! 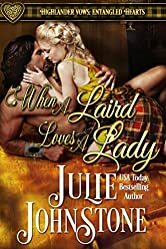 Julie is a new to me author and I have been known to read a Highlander romance. Yay! I hope you will enjoy me book! What a wonderful set of covers. They all look wonderful together! Thanks for sharing☺️ Good luck with the giveaway! Aww! Thank you so very much! I’m honored!